Rapid heat-and-cool molding technologies have attracted increasing interest and use in plastics and composites molding. However, there are still challenges to address before rapid heat-and-cool (H&C) technologies will become widely established as a new molding standard. One of the key challenges is educating the industry on what H&C molding can do and how to quantify the advantages it offers with specific resin families. A year ago, Roctool sought to address these needs with a new approach whereby we proposed to work with resin providers to quantify the advantages of our H&C technology with their materials versus conventional molding methods. This growing materials database can be used by molders to determine their tool-design choices and by OEMs in their part-design decisions. The results are also shared with Roctool users to support them in their continuing search for improved performance, quality and cost-effectiveness. Many already know that H&C molding can improve surface quality, such as hiding visible weld lines and flow lines. However, our ongoing investigation with resin providers is demonstrating many other advantages that can greatly help molders around the globe: increasing flow length, reducing or eliminating sink marks, reducing pressure drop, enabling thin-wall molding, and enhancing surface replication for optical and functional applications. The latter benefit, in particular, is one reason Roctool has adopted the trade name “HD Plastics” (HD for High-Definition) to describe our overall H&C technology program. Another challenge for H&C molding is cycle time. Many years ago, when Roctool started using its induction heating technique for rapid H&C injection molding, there was an unacceptable cycle-time penalty. Today, we are able to match a conventional molding cycle or even reduce it, depending on the resin used. At NPE2018 last month, we demonstrated a 16-cavity tool molding glass-filled PBT/ASA parts, each with a different surface finish or texture, in a 20-sec total cycle time on a KraussMaffei injection machine. This is a game changer, as now you can make defect-free parts and not sacrifice productivity. We have not seen any other heating method able to heat and cool so quickly and with such accuracy and control. The final challenge for H&C technologies is the ability to integrate heating elements into a complex tool. Our flexible induction coils are available in many diameters and can now be integrated into complex tooling, as we illustrated at NPE2018 in displaying a hemispherical polycarbonate part. Roctool’s patented technology consists of designing a H&C mold layout in order to provide fast and homogeneous heating. Flexible inductors can follow any complex tooling shape. A high-frequency current is generated to run through the inductors, creating eddy currents and a joule effect to heat the mold surface up to 1000 C (1832 F) at rates up to 25° C (45° F) per second. What’s more, the heating is applied only to the cavity surface rather than the whole mold half, minimizing energy consumption. Using standard water-cooling channels and ensuring a fully turbulent flow rate enable efficient cooling of the tool. Heating and cooling are both controlled automatically with aid of thermocouples in the mold. Mutiple heating zones can be accommodated. This technology works with P20 and other conventional mold steels and with any type of injection press. Three case histories of customers that switched from other molding methods to rapid H&C with Roctool induction technology. Electronic OEM Dekko, based in Garrett, Ind., produces high-gloss electrical and USB power packs. Before using H&C technology, Dekko had to deal with part defects and surface imperfections such as knit lines, flow lines, gate blush, and splay. Dekko chose Roctool induction H&C over other technologies for two main reasons: First, H&C offered a cost-benefit vs. changing the part design to achieve what was required with traditional tooling. Second, Dekko uses a variety of molded-in colors, and Roctool H&C technology provides excellent surface quality that avoids the need for paint. “The benefits for us have been largely in the final part appearance, with the elimination of surface defects. Roctool helps us to open the design window to make things feasible that were not achievable for us before,”states Jerry Zawadzde, Dekko program manager. Flex, based in San Jose, Calif., has used all types of H&C technologies for many years, including heating with steam, pressurized water, and electrical cartridges. Flex began working with Roctool after the K 2010 Show in Dusseldorf. The first Flex mold equipped with Roctool technology was for a very thin electronic e-reader/tablet housing. Induction H&C technology was able to fill the part completely, reduce cycle time, and cut energy consumption, thereby outperforming pressurized hot water. Flex changed to Roctool induction technology for several reasons, including that it is a clean, safe system offering faster cycle times, lower energy consumption, limitless material possibilities, better temperature control, and low corrosion on molds. Flex faced challenges in changing to Roctool technology—mainly convincing technicians and other coworkers to try something new and different. But Flex is looking to use Roctool H&C technology in the future to be able to process all types of materials, including carbon-fiber composites and new product designs through light-weighting and in-mold decorative effects on high-value parts. “Roctool can be environmentally friendly due to eliminating the need for secondary operations, and is very safe for operators, which comes at no extra price,” explains Sebastien Ignotis, director of Advanced Engineering at Flex. A complex 3D shape molded by Flex demonstrates some of the capabilities of induction-based H&C molding. Exhibited by Roctool at NPE2018 last month, the product is a sphere composed of two snap-fit parts, one of which has multiple oblong holes of different sizes and a curved depression in the top. 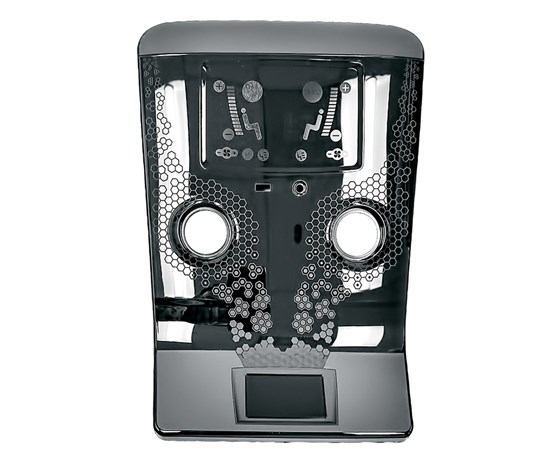 It is molded of 10-50% glass-filled PC and has thin walls, high gloss, and a molded-in logo. The part is center-gated behind the logo, but the H&C process leaves no sink mark or blemish. This product design is used by Flex for both a room scent diffuser and a Bluetooth audio speaker. Dedienne Multiplasturgy Group in France was one of Roctool’s first users. This diversified custom plastic processor wanted to maintain its leadership in an evolving market and anticipate the needs of its customers in terms of innovation and differentiation. Dedienne uses Roctool H&C technology for both injection and compression molding. Increased efficiency in compression molding of high-performance materials at high temperatures has made them accessible for mass production. Normally, these materials are reserved for short runs because their processing requires a large amounts of labor and long cycle times. Thanks to rapid induction heating, Dedienne is able to produce a part in a few minutes that would have taken hours otherwise. The ability to heat the mold quickly and fully control temperature distribution opens up new molding possibilities, including shorter cycles, increased part quality, and longer flow lengths. The hot mold can impart a Class A finish or replicate the finest surface texture. It is now also possible to fully simulate the H&C process with induction heating using Autodesk Moldflow software. SABIC, a major global producer of plastics and chemicals with U.S. headquarters in Houston, has collaborated with Roctool for many years. Combining Roctool’s induction-based H&C technology with SABIC’s broad materials portfolio has helped to push the performance and aesthetics of finished parts to a higher level and opens up new application opportunities. Using Roctool technology, SABIC has demonstrated the ability to achieve a glossy finish on injection molded parts with materials that have historically presented challenges with regard to surface appearance—such as 30% glass-filled Ultem 2300 polyetherimide (PEI), and 50% glass-filled polycarbonate (Thermocomp D551). Additionally, SABIC validated the possibility of combining a low-gloss effect, using texturing, with a high-gloss effect in the same part—a cosmetic effect that appeals to designers. SABIC is now supporting Roctool’s initiative to quantify the effects of induction H&C technology using the HD Plastics Database. Creating a central repository of relevant data on surface replication, weld-line strength and flow length with different materials can provide specific data points to help customers understand the levels of improvement in parts that can be achieved with this H&C technology. The material characterization is part of Roctool’s ongoing work with resin providers to develop the HD Plastics material database, which is designed to help OEMs achieve exceptional part quality and increased performance. Roctool is constantly adding new providers and materials to grow and reinforce this source of information, which is currently available only to Roctool users but in future will be available to others with a subscription. One snapshot from that database is pictured above. IDH stands for “Induction Dual Heating,” a new technology for molding parts combining a continuous-fiber thermoplastic composite blank and injection overmolding with additional thermoplastic compound. Such “hybrid” composites are gaining interest because they offer light weight, high strength and stiffness, and design freedom to overmold 3D details and provide surface aesthetics without secondary finishing—and all within a 60-sec cycle time. Current hybrid composite overmolding processes generally utilize an infrared oven for preheating a consolidated thermoplastic “organosheet” and then transport the softened sheet via robot and/or conveyor to the cold mold. IDH technology uses a single induction generator for the entire process. It starts with robotic placement of a cold composite insert in the tool, which is already heated by the induction generator. Meanwhile, a small amount of power is sent to second, small induction heating station to heat up a sheet of solid graphite of the same size as the composite insert. The robot takes the hot graphite sheet from the induction station and places it close to the exposed “B” side of the composite insert in order to heat that second surface by radiation. The composite insert is then stamped to the desired shape, the mold opens, and the mold half with the composite insert rotates into the injection station for overmolding. The induction generator switches power from the stamping mold to the injection mold and back again. Induction heating is more efficient than infrared and can heat to higher temperatures. Replacing the usual infrared preheating of the organosheet before placing it in the mold eliminates the difficulties of handling and precisely positioning a floppy piece of hot organosheet. It also avoids the problem of the preheated insert cooling during transfer. IDH is able to control the heating of both elements in an intelligent way, by adapting the heating time and power automatically. This system is also much more compact and thereby meets the constraints of the electronics sector. IDH provides a resin-rich surface, is adapted to complex geometries, and can utilize nonwoven and sandwich composite inserts, which can be more difficult to handle when hot in the conventional process. What’s more, IDH can even use non-consolidated sheets, saving a processing step and potentially reducing the cost of composite raw materials. IDH can provide multi-zone heating at temperatures up to 400 C (752 F), and is suitable for both thermoplastic and thermoset materials. 40% shorter cycle time of 60 sec, vs. 100 sec with conventional hybrid composite molding. 54% lower energy consumption (2.3 kWh vs. 5.0 kWh) utilizing the same process-temperature range. 28% smaller footprint, using the same vertical injection machine and six-axis robot. ABOUT THE AUTHOR: Mathieu Boulanger joined Roctool in January 2004. In 10 years at Roctool headquarters in France, he was responsible for global sales, key accounts, and strategic marketing of the company’s technologies, which he helped introduce into such markets as automotive, electronics, consumer products, and aerospace. In 2013, Matt started developing the North American subsidiary for Roctool, now based in Charlotte, N.C. In 2015, Matt was named Roctool CEO.